Peruvian Gold’s Head Start is a first use liquid fertilizer for all plant seeds, seedlings and transplants. Derived from Winterfalls’ composted llama manure, hand harvested Norwegian kelp extract, (Ascophyllum nodosum) and artesian well water, Head Start Improves seed germination and increases root development. 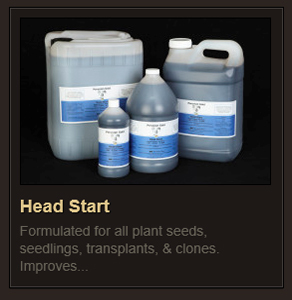 Head Start provides the nutrients needed to promote vigorous growth and nutrient healthier growing media for your seedlings, transplants, and young plants. Head Start produces a healthier, more productive plant even in times of stress including drought, salinity and temperature. Head Start improves your plants’ ability to resist and better recover from stresses. This enhanced stress resistance and recovery has been demonstrated on a wide range of gardens and plants. When a plant is treated with Head Start before a stress occurs, the plant is better able to tolerate that physiological or environmental challenge. Trees or vines treated following harvest show enhanced recovery from the stress of harvest. 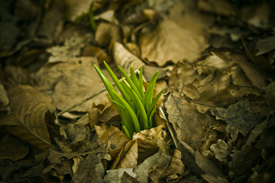 The plants are better prepared for dormancy and build reserves a strong next season. Plants treated with Head Start are better able to make the most efficient use of water and nutrients giving you optimum output. Plant hormones promote and influence the growth, development and differentiation of cells and tissues. Being able to understand and promote specific plant hormones at the right times can mean a healthier, more productive garden. Head Start can elicit natural cytokinin and auxin production in plants resulting in better growth with more buds, healthier, greener leaves and increased tolerance to environmental stresses. Head Start provides better root development for your seeds, seedlings, clones, and transplants. Head Start provides the nutrients needed for vigorous root and plant growth. Plants are more productive and resistant to environmental stresses such as heat, cold, drought, harvesting and pests. Head Start improves cytokinin-like activity vital to plant health and garden yields. It stimulates cell growth and division, shoot initiation, bud formation, leaf expansion, and chlorophyll synthesis. Designed to promote vigorous root development and plant growth. Helps develop a nutrient healthier growing media. For seedlings, transplants, seeds, and young plants. Produces healthy, productive plants even during times of stress. Increases root and plant development. Helps plant to manage nutrient uptake more efficiently.